May is winding down, and high school and college students across the country are ordering their graduation caps and gowns. 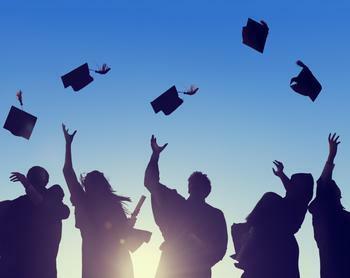 While many may be nervous to receive their diploma and start the next phase of their life, a report from the National Retail Federation (NRF) shows that they can at least look forward to a nice card or gift for the occasion. In an annual survey conducted with Prosper Insights & Analytics, NRF reports that more consumers will be giving gifts to graduates this year – 36% compared to 34% last year. Total spending is expected to exceed $5.6 billion, topping last year’s figure of $5.4 billion and the largest number in the survey’s 11-year history. “As students mark the end of one chapter in their lives and start the next, friends and family will help prepare them for this new journey. From gift cards to clothing and electronics, retailers will have their shelves stocked with a variety of options,” said NRF President and CEO Matthew Shay. Analysts say that the most popular gift this year will be cash, an answer given by 53% of respondents; however, that option is becoming less popular over time, dropping 10% since 2009. Forty-one percent of consumers say they’ll opt to give a greeting card, while 33% will give a gift card, 16% will give apparel, and 11% will give an electronic device. The survey shows that many young Millennials plan on giving gifts to their peers for graduation, up 6% year-over-year to 48%. “While greeting cards are most likely to be exchanged among 18-24-year-old, gift cards, cash, and apparel are other popular options. In fact, this group is nearly twice as likely to give clothing than the overall average,” noted Prosper Principal Analyst Pam Goodfellow. Due to their smaller budgets, these young consumers will spend an average of $78.42 on their graduation gifts. Older consumers report that they’ll be spending slightly more: those between the ages of 45 and 54 say they’ll spend an average of $119.84, while those 65 and over will spend $112.34.